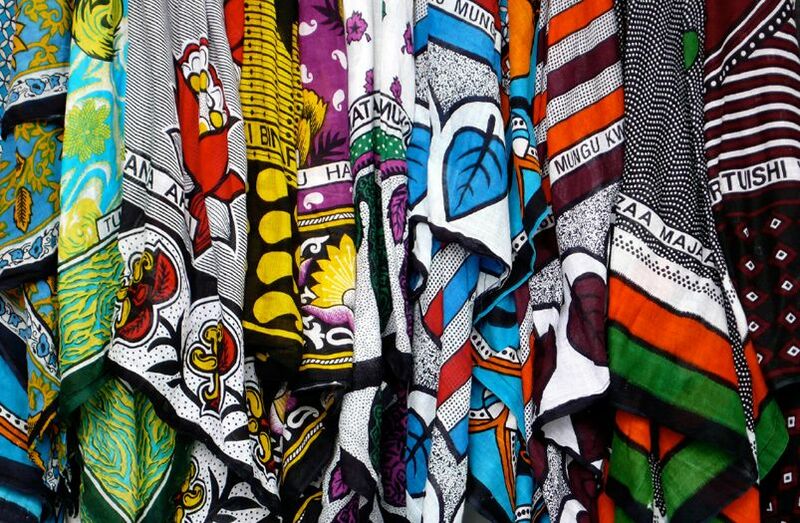 The kanga which comes from the old Bantu (Kiswahili) verb ku-kanga to wrap or close, is a colourful garment similar to kitenge, worn by women and occasionally by men throughout Eastern Africa. It is a piece of printed cotton fabric, about 1.5m by 1m, often with a border along all four sides (called pindo in Swahili), and a central part (mji) which differs in design from the borders. Khangas are usually very colorful. Khangas have for as long as is known been a traditional type of dress amongst women in central/east Africa. In the East African countries phrases in Kiswahili are traditional, while in Central Africa phrases in both Kiswahili and Lingala are popular. One of the longer edges of the mji features a strip which contains a message in Swahili, or less commonly in Arabic or Comorian. Other countries which produce their own Kangas write the Kanga messages/names in their main languages: in Madagascar (Malagasy Republic) where they are known as lambas, they feature ohabolana, traditional proverbs written in Malagasy; they are also produced in Zambia and Malawi. This message is called the jina (literally ‘name’) of the kanga. Messages are often in the form of riddles or proverbs. Kanga’s can be used in various occasions and in various ways either symbolically or for practical reasons. * Kanga’s are used in different settings to convey various messages. * In Malawi, Chitenjes are customary at funerals for women. * They are also used as a sling to hold a baby across the back of a mother. They can be used to hold the baby at the from as well. Particularly in breast feeding. * Chitenges are given as gifts to young women. * They are sometimes tied together and used as decorative pieces at dinner tables. * When women go to the beach, often the Chitenge is wrapped around the bathing suit for modesty or to shield cold air. * Chitenges can be framed or otherwise hang up on the wall as a decorative batik artwork.